I know the subject material is great, but this is a superb shot, definitely one of the better ones I've seen of that place. AWESOME AND WONDERFULL CAPTURED OF THIS NICE MOMENT..! THE MOUNTAIN'S 'R SEEMS VERY BEAUTIFULL AND AMAZING ..
NICE AND GREAT COMPOSITION WITH GOOD DETAIL'S..
WITH BEST REGARD'S OF NASEER AHME DFEDAEE.!. 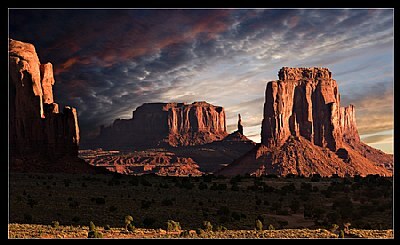 Bogdan, this is a spectacular image of Monument Valley (I live in Utah, where this picture was taken). You have elegantly captured the energy that this locale holds with the deep colors, excellent composition and wonderful capture of light that this image exudes. You are vrey deserving of recognition for this image. Bravo! ABSOLUTE MARVEL. YOU USED THE LIGHT SUPERBLY. TOP CLASS SHOT. So beautiful to see this on the front page again! Where are you these days? Hope everything is okay with you. Just amazing. Such an awesome mood to this photo. A spectacular shot, Bogdan. Congratulations on your well-deserved awards. WOW! Simply amazing! Great light! Wonderful colors! Not a classic view of this valley, a great unusual vision! Congrats on your double award! Wow! Outstanding capture. I liked your composition, monument valley at it's best. Those dark clouds are really scary. Well done. I was there in July and not a single cloud was in sight. Well, photography also means visiting the place again and again, right? congrats on both the awards. Fantastic drama in this image! I can see this on a postcard or a calendar, or maybe in a coffee table sized book. best congrats..i se also another award.. sure! nice shot .. nice shadows .. cons. Very beautiful, lovely light and composition. Congratulations! Looks like an absolutely fascinating landscape Bogdan, and very well captured. Congrats on the awards. Simon, what would infuse this with the passion you believe is lacking? Critical comments are most useful when they provide suggestions on how to improve the image or the photographer's art. wonderful light and great composition, masterpiece capture. very nicely done. WOW, I was at this place in April but don't remember it being this beautiful. This makes my shots look like childs play. Just an outstanding image that anyone be proud to hang on their wall. sorry,my mistake as thought you were new but found that i left you a comment back in June of 2004!...that low K number caused me to assume you were very new....you have a stellar portfolio...do you sell your work thru a gallery,or rep.? Congrats for well deserved awards! This is a very spiritual place and you did it justice,Bogdan....welcome to UF! The combination of the light and the sky make this an outstanding shot. Nice work indeed. An outstanding landscape image, Bogdan! Wonderful colours and shadows. A very moody landscape image! Congratulations on your double awards! Yeah, this goes into my favorites! What an outstanding shot you captured! excellent exposure range, with jaw-dropping lighting. What a PERFECT balance between foreground, background and sky. Weighting is even, and depth is off the CHARTS! This here is a great photo, I wonder how is the filling to be there when took this image with you emotions not just with camera!!!! Simply superb, awesome dramatic lighting & clouds. Details is seen in the shadows, it definitely merits an award, congrats on a beautiful image Bogdan. exceelt shot.I like the warm tone.great perspective and wonderful composition. Stunning picture,,,well done all around!! This is AWESOME!!! Wow Bogdan...Fantastic! Speechless! Excellent capture. I think you caught the feel of sunset in the desert very well. Some fantastic natural colours here, and you've captured them just right! It's that sky that makes the picture - good job!